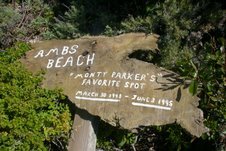 the identity of “Monty Parker,” whose name, birth & date of death appear on a post at secluded “AMB” Beach on the South Coast. 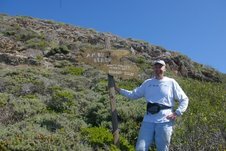 Larry suggested we drive south to the Prankster rappel spot where he remembered there being a mysterious sign dedicated to “Monty” Parker. I hadn’t seen it on my first exploratory trip there and he was curious if it was still there. It was. I hadn’t noticed it because it had fallen over into thick bushes sometime in the last 15 years. That and the fact that the Prankster Rappel spot was about a hundred feet north of where I had assumed it had been. Who was Monty Parker? What killed him so young? And who is AMB’s Beach, his favorite spot in the world, named after? My theory/ guess is A.M. Parker may be Catholic and have assumed some confirmation name like Barry. No evidence of that, but the odds of his two first initials being the same as the first two letters of AMB Beach is about 625 to one. I always like to bet on those kind of odds. It looks like early May will be our next trip to Acid Beach, and this time we plan to swim from Acid Beach to The Notch. It was too deep and the surf was too big to wade through on our last trip. Boogie boards and better protection for my camera are being planned for. 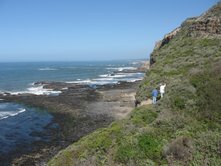 Might bring a ladder to get up to the ledge leading to the ocean-side of Warm Water Lagoon. We might even be able to make it over the double arch. Meanwhile Larry Fitterer, also curious about the provenance of AMB Beach told John he was on to something. He had found an “AM Parker,” who lived in New Mexico. The birth and death dates matched those found on the monument at the beach. Said Larry: I’ve wondered whether “Amb” is an abbreviation. Guessing that it might be short for “Amber,” I queried zabasearch.com and found an Amber Parker living in Santa Cruz. Perhaps she is Monty’s daughter. I am glad you and Meg were able to ascertain the northern “route” into Acid Beach. Next time we go out together, perhaps we can make the journey halfway down (without ropes), though I would probably be reluctant to venture must farther even with safety ropes. Still, the halfway point does provide a pretty spectacular view of the cove and surrounding area. I spent some more time the other day thinking about “AMBS” I wondered if perhaps Ambs is a surname… As it turns out, Ambs is indeed a surname; German, in fact. There was only one hit for that name in the Bay Area, an Ambs, who by my reckoning, had moved to Maryland. ‘Dear Larry, thanks for your email. I actually visited this part of California several times in the 90s and lived for a brief period in California but the sign is not my product. It’s most likely not related to me. Thus, I cannot help you with the history of that sign. Ambs is actually a German name and originated in the southwest part of Germany’. This entry was posted in Acid Beach, AM Parker, AMB Beach, John Vonderlin, Larry Fitterer, Monty Parker and tagged John Vonderlin, Larry Fitterer, South Coast beaches. Bookmark the permalink.